As we sit in our gardens enjoying the summer, now is a good time to cast our minds forward to next year. There is an old saying that the gardening year starts in September, which is very true and the smart gardener who thinks ahead can also take advantage of bargains that are available for plants that have already flowered but are best planted soon so they establish well and develop for their next blooming season. At this time of year if you are fortunate enough to have some wooded areas in your garden you are probably enjoying the shade they provide from the summer heat. Deciduous trees are beautiful in the garden, but sometimes the areas beneath them can be less than exciting, since the shade limits the choices of suitable plants. So putting these two ideas together – planning ahead to take advantage of bargains and bringing some color and excitement to your shady, wooded areas – let’s look at some choices for flowering shrubs that thrive beneath trees. Of course these beauties are also ideal choices for the shady side of houses, fences and hedges too. ‘Location, location, location’ is as good a rule for plants as it is for house buying, so finding the ideal spot to plant shade-loving flowering shrubs has to be step one. Underneath evergreens is usually just too dark, especially in early spring when a lot of their new growth is made, so stay away from those areas. However on the north side of evergreens, or a house, is another story. If you are in the shade but can see the sky, you have found the sweet-spot for these plants. From a practical point of view, in such a location they will grow well and screen the denser shaded areas from view, so they won’t just be a blank eyesore in the garden. Beneath tall deciduous trees often works well, especially if the branches are high up, so those spots are also perfect, although again, if you can see a little sky when you look up that is even better. Prepare a good bed for your plants, a little away from the trunks of the trees and mix lots of peat-moss into the soil, as most woodland plants are acid-loving, which the peat will help develop in your soil. Mix in some fertilizer for acid-loving plants and be prepared to use it regularly – trees take a lot of goodness out of the soil and a combination of peat, compost and fertilizer at least once a year will nourish you shrubs and give outstanding results. Fertilizers vary a lot, so always follow the directions on the packet. Rhododendrons and Azaleas form the basis for any woodland garden. No matter what your local climate, there will be something to choose from in this enormous group of hundreds of plants, evergreen or deciduous, large or small, in all the colors of the rainbow. Of special interest are the Encore Azaleas. Although some are hardy in zone 5, the majority thrive in zones 6 to 9, loving the warmer winters and responding with cascades of bloom. What makes them so special is their ability to bloom not just in spring, like all the other azaleas, but also in fall, bringing a brilliant and colorful ‘encore’ to the garden season. Rather than waiting a whole year to enjoy them again, you will enjoy another blooming and many will also bloom a little all summer long, seeming never to be completely out of flowers. These shrubs vary between three and five feet in height and are about the same across, making them large enough to have presence in your garden but small enough to fit into modern, smaller garden spaces. 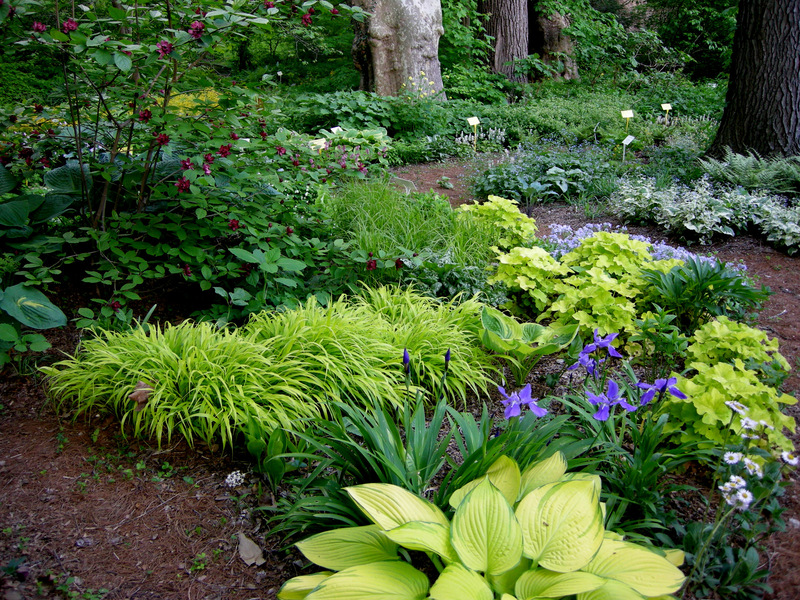 If you do have larger spaces to fill, then plant several, allowing half the listed spread as spacing between them. Imagine drifts of these beautiful plants among your trees and the magical charm they will bring to your garden! Although often ignored, white is actually a fantastic color in the shade – it really glows and brings the space to life in a way darker colors cannot do. So consider using the Autumn Angel Encore Azalea, which grows to just three feet and will be smothered in its beautiful, pure-white trumpet-shaped flowers twice in every growing season. They will also do well in partial or even full sunlight, if there is sufficient water available, and with their compact size they can be grown in pots and planter boxes too. For an unusual and striking color, plant the Autumn Lilac Encore Azalea with its perfectly-formed flowers in a rich and glowing shade of lilac. It too grows to just three feet and makes a perfect companion for the Autumn Angel Encore Azalea – that white and lilac combination is perfect for any shady place in your garden. These shrubs differ from azaleas in having larger leaves, without the fine hairs on azalea leaves and also in usually having larger flowers in big bunches at the ends of the branches, rather than scattered all over the plant. This gives a more dramatic and majestic appearance to the plants and the foliage is a striking feature even when there are no blooms. A tip for doing well with rhododendrons is to take a few minutes as soon as flowering has finished and remove the spend flower stalks. Don’t do this by cutting, but just take a firm hold, bend and snap them off directly above the topmost leaves. By doing this you divert the energy the plant would spend making seeds into making next year’s flowers instead and giving you a rich blooming season every year. Some rhododendrons are hardier than azaleas, so if you live in colder areas they are a natural first-choice. One of the best and hardiest is the Pink Rhododendron English Roseum, which forms a medium-sized shrub between four and ten feet tall, depending on conditions and climate, and growing about the same or a little more across to make a majestic dome-shaped shrub. Every spring the foliage will be almost completely hidden by the large trussed of blooms at the end of every branch, each one made of many trumpet-shaped flowers in a wonderful, clean and perfect pink color. This shrub literally glows in the garden and is something to be proud of, besides making a big impression on guests! Best of all it is hardy to at least minus 25 degrees, so it will even thrive in zone 4, where most other rhododendrons will perish. Equally hardy and bringing some brilliant white color to your shady places, this time splashed with yellow centres in each flower, is the Lemon Ice Rhododendron Chionoides. This heirloom rhododendron, bred in the 19th century and still going strong, is a compact three to four feet tall and is a perfect choice for the foreground in front of a larger plant. It will grow well from Minnesota to Virginia and makes a terrific companion to the Encore Azaleas in warmer areas. Another compact, hardy plant is the April Rose Rhododendron, with rosy-lilac flowers that look splendid in front of English Roseum. For warmer regions choose the slightly larger and deeper colored Purple Rhododendron Edith Bosley, which has a rich color like the robes of a queen. Plant it among white azaleas for a stunning combination. To extend the flowering season in your woodland garden, include some hydrangea bushes, which love the same conditions but flower in summer and into fall. This means your shady garden will never be without color and interest throughout the whole gardening season. Whether you choose the cold-hardy pink Sunday Fraise Hydrangea, growing just four feet tall and across, or the even more compact and delightful Perfection Double Delights Hydrangea, these plants are sure to please. For background, the Tardiva White Hydrangea can top 10 feet tall, making a dramatic climax to the gardening year with its huge, conical pure-white flowers, which last right into the cold weather, slowly turning pinkish as they age. This is really just scratching the surface of the possibilities for a woodland shrub garden, with camellias immediately coming to mind as additions. Don’t forget the Dogwood Trees if you have a little more room and perhaps a Holly Tree for winter interest and berries too! A woodland garden of flowering shrubs can be a major feature in any garden, turning an often neglected part of the garden into a place of great beauty and interest all year round. I love this design and feel these plants would thrive in my yard! Can you provide a plant list?